Last weekend the Good Chance Theatre in the Calais ‘Jungle’ refugee camp had to take the decision to close after six months of being a ‘space of welcome, hope and creativity’ in ‘one of the most notorious places on the planet’. 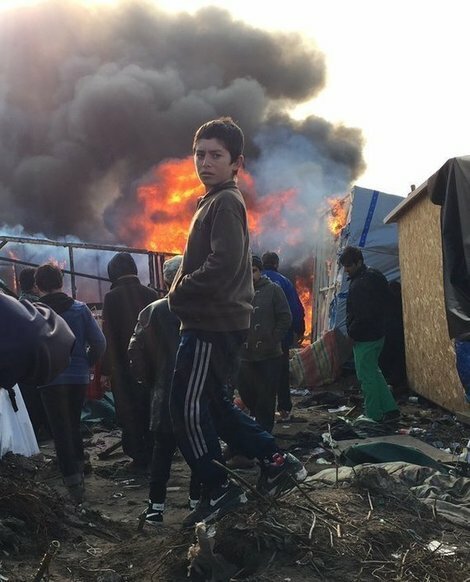 For the past two weeks the French authorities have been systematically destroying the camp. Bulldozers have been removing temporary structures (people’s homes), fires blazed all over the site. Photographs on social media show the area that was home to thousands of people who had fled violence and oppression looking like a war zone itself. Though the theatre was legally protected as a ‘Lieu de Vie’ (Place of Life) the artists running it took the decision to dismantle it as the community it served had been decimated and displaced. It is a sad end to a project that has been an inspiration to many. Good Chance (read their moving closing post here) showed how theatre and art can offer humanity and opportunities for expression and engagement in the worst of situations. It was a frontline initiative that delivered something life affirming and useful to people whilst raising the profile of their situation far and wide. So without the colourful dome physically being in Calais anymore what is the future for the people it served and the message it conveyed to the world? The initiators of the project and the many artists who joined Good Chance to volunteer feel strongly that the work should continue. They are even now campaigning for the 291 unaccompanied children displaced from the camp to be given asylum in the UK. The plight of these people must be brought to public notice and politicians made to take action. Good Chance has been hugely effective in facilitating the articulation of the situation – How can we all take that further? I pose that question particularly in the light of the new ‘anti-advocacy’ legislation. As you may have seen, the government has announced that from 1 May government grant agreements will include a clause that prevents the funding being used for influencing (health warning on this press release from the Cabinet Office some of the quotes about ‘common sense’ and ‘value for money’ will make you choke with rage). This includes grants given through arm’s length bodies such as the Arts Council. NCVO (National Council for Voluntary Organisations) have written some useful briefings on why the clause will be counter-productive, three types of grant that will be affected and five unanswered questions from Rob Wilson’s (Minister for Civil Society) ‘clarification’ article that need to be addressed. In my view there is, right now, a great deal of desperate injustice, oppression, inhumanity and general outrage happening both domestically and globally. Arts and voluntary sector organisations have a potentially huge role to play in highlighting those problems (because they are dealing with them directly), engaging the public in helping to solve those problems (because they see how) and creatively articulating both need and action required – Yes influencing for God’s sake! Many ITC companies are already working on the ground with disenfranchised, disadvantaged groups. Graeae has mobilised a brilliant campaign around Access to Work and the Disability Living Allowance – helping articulate strongly the issues for people whose voices are not heard and who are living in fear of losing their livelihoods and independence. Clean Break works closely with female prisoners to express their stories, raise awareness, and provoke debate – hoping to reform the criminal justice system. Cardboard Citizens work with homeless people and use Augusto Boal’s Theatre of the Oppressed techniques to challenge, engage, criticise, activate, disturb – Make something happen! People’s Palace Projects work with young people in the Favelas of Brazil. They address the deprivation they find through creative activity and they also make sure people know about the effects of poverty in these places. What for? So something will be done about it. Belarus Free Theatre fled oppression from a dictatorship and work as a refugee theatre company within the Young Vic – fighting the cause for freedom of expression wherever they see it threatened. In the face of the gross injustices of the world all these projects can feel like tiny drops in the ocean of overwhelming need – but the arts can punch above its weight and create ripples in that ocean by moving and engaging people. It would be disastrous if arts organisations felt that they had to reign in their ‘influencing’ work in the face of the ‘anti-advocacy’ rules – particularly since this might only be because the rules are so broadly and vaguely expressed. We all need to challenge these rules and find out what they might mean in practice. The most important message at the moment is not to self-censor in the fear of the unknown. One final thought – ITC doesn’t receive any public funding from anyone so whatever happens we can say what we damn well like and fully intend to. Obviously we are accountable to our members but we are reasonably confident that most of you don’t want to stay silent about the crap that is going on in the world. This sector wants to get out there and ‘influence’. So make use of us - let’s be bold together! I am incredulous that you genuinely believe that arts will help people affected by war, disease, famine, and murder "because they deal with them directly". You seem to really believe that! "Hi Jimmy, I'm sorry, the doctor says he can't cure your tumour. But here, Tracey Emin has made a bed for you!" "Let's figure out a way to teach people about not sharing needles... after we've choreographed an interpretive dance about it." Arts are all very well and nice, but science and rule of law are the actual answers to injustice and oppression. Anything else is just an unhelpful distraction. Well said! It is so important that we raise these questions about 'anti-advocacy'. You know friends chine first organized this solitaire free game,i told you please try to play this game,it is very addition and amazing card game solitaire games basically players remove the cards from the table,now play or accepted the all challenges. Influence is something that people are trying to make things on https://www.rushmypapers.me and then getting away with it. It's not like this from beginning and it's going to end very soon. I can talk to people about it.